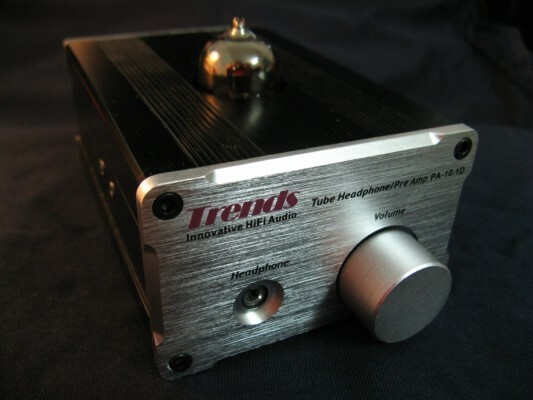 Trends Audio unveils PA-10.1D Tube Headphone/Pre Amplifier for supporting Bi-amp audio system! Trends PA-10.1D Tube Headphone/Pre Amplifier. It provides all functions of headphone amplifier and pre amplifier as well have fun tube rolling. New Trends PA-10.1D includes a swithchable input(CD/DAC or PC/iPod)and two inputs for targeting Bi-amp audio system below US$1,000 budget. Meanwhile, it applies ELNA capacitors which result in improved transient performance, enhanced spatial accuracy and low frequency realism. « With pure class-A circuit and low voltage hybrid (tube/transistor) preamp provides audiophile quality sound and easy/safe DIYer accessibility, new PA-10.1D Tube Headphone/Pre Amplifier is an affordable and compact hybrid pre amplifier and the economical way to enter the true high fidelity headphone system. » say David Ho, the marketing director of Trends Audio. « As you know, the Hi-Fi product is no longer <>. In addition, changing different tubes to taste for different sound is the great fun for many audiophiles and also a great feature of Trends PA-10.1D. A creative device that you can use to add color to individual tracks. * support both 6DJ8/6922 series and 12AU7 series tubes by simply switching the jumpers. * the innovative circuit design of low voltage hybrid (tube/transistor) pre-amp to provide audiophile quality sound. * ONE bi-triode 6DJ8/6922 or 12AU7 tube as voltage amplification and TWO MOSFETs as output driver which perform the warm, comfortable tube sound and in addition, guarantee the high fidelity & sufficient driving power to the next power amplifier stage. * Besides the normal audio output in the back panel, ONE headphone output in the front to drive even high-impedance audiophile-grade headphones. * compact design (mini-size & light weight), suitable for hi-fi room, living room, sleeping room or even right beside your laptop computer or iPhone-Fi. * TWO precise screw-driving potentiometers for professional audiophiles to adjust the tube*s bias voltage to guarantee the best working point for different tubes. * require just a single +24V power supply ONLY, besides the bundled AC adaptor, audiophiles can apply all other power supply with the same spec., e.g. lead-acid batteries. * separate pre-amp unit & power adaptor to minimize interference and flexible to apply other power sources, e.g. lead-acid battery. * new stylish aluminium case(4mm thick) provides outstanding shielding & grounding capability to keeps the background silent and maximize the S/N ratio. Trends PA-10.1D Tube Headphone/Pre Amplifier will be available in November and the suggested retail are Special Edition US$299 (with Russian 6H23n tube)and GE Edition US$299 (with USA 12AU7 Tube) and it may be the first and the most competitively priced Tube Headphone/Pre Amplifier for Hi-Fi and iPhone-Fi market. Trends Audio is a Hong Kong based company working in audio/video and multimedia production. Since the release of Trends TA-10 Class-T Stereo Audio Amplifier in 2006, Trends has received many prizes from Hi-Fi Magazine and Hi-Fi community worldwide. Trends Audio’s products have become legendary for their compact design, performance and reliability in high end audio market.